Tall Trees is a Tree Health Care Company offering a full range of tree services. 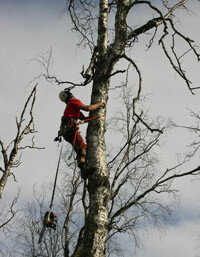 We will strive to provide the highest level of tree care and removal services in Alaska. We will meet or exceed industry standards through continuing education, safety and teamwork. As a Christian owned business we hold fast to God’s words in Colossian 3:23: “Whatever you do, work at it with all your heart, as working for the Lord, not for men”. Mike & Marianne Post have been married for 22 years and have 5 children: Joseph (18), Daniel (16), Cosette (14), Juliette (7) and Daisy (6). Mike has a degree in Forest Biology and has been involved in the tree industry since his teenage years. Marianne is busy homeschooling and raising their children and is involved "behind the scenes" doing a lot of the administrative work. We value ethics, professionalism and education for our employees. We have weekly safety meetings. We promote and have opportunities for our employees to further educate themselves in tree industry related subjects and standards. Our employees are valued. They are also expected to follow our company’s code of ethics, to have a positive attitude, and to be helpful and respectful. We have been serving our community for 15 years – since 2001! http://www.isa-arbor.com/ -- Through research, technology, and education, the ISA promotes the professional practice of arboriculture and fosters a greater worldwide awareness of the benefits of trees.